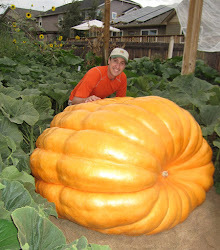 Giant Pumpkin Growing Tips From The Pumpkin Man: Thanks Joe & Lisa! Finally a Pumpkin Pic. I wanted to put down some 20-20-20 down but all I could find localy was 20-20-20 for orchids. Is this stuff ok? It probably is okay. Take a look at the ingredients. I'm less familiar with Orchid fertilizers and if there would be anything special for them.